Google Play Music subscription goes live in India - AndroGuider | One Stop For The Techy You! Google's Play Music Store was launched in India last month. At launch, only the option to purchase songs or album were available, but did not have "All Access feature", which is basically an unlimited music streaming service. Today the Play Music All Access service called Subscription has gone live in the country. Earlier you had to pay Rs. 15 per song on the Play Music store, but now you can use the service with a monthly subscription. The monthly ad-free service offers free unlimited streaming and downloads of over 40 millions local and international songs, personalized recommendations, unlimited skips and choice of songs, albums and playlists. Play Music also lets you create playlist, offline and browse music by language, artists or music directors. You can even watch music videos within the app as well. It also lets you upload 50,000 songs from your collection to Play Music. Google Play Music's all access premium service is available at a discounted rate of Rs. 89 per month if you sign-up before May 18, 2017 or within the first 43 days. The price may increase after that period. Google is also offering a 30 days free trial of the service. 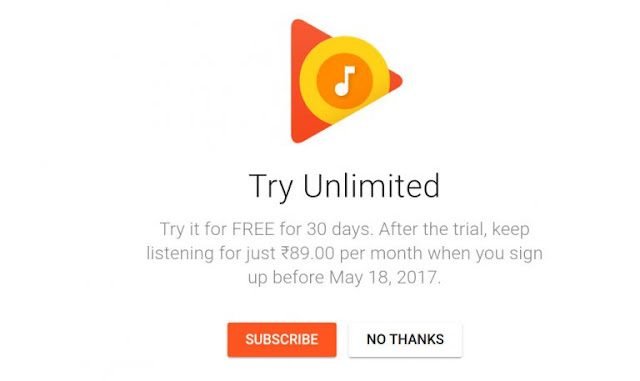 By comparison with other music services, Google Play Music's Subscription is cheapest in the country. Rival Apple's Music is priced at Rs. 120 per month, while local streaming services like Airtel's Wynk Music, Saavn Pro, Gaana+ and Hungama Subscription costs Rs. 99 per month.